casper&pearl: the year that was. Yay! So many happy fun things happened in 2012 and we're so greatful for all of the amazing opportunities that were handed to us. In one year the brand has suffered from immense growing pains and has gone places we couldn't have dreamed. So to recap here are some of the things that we have accomplished, created and loved in 2012. - we celebrated our first birthday! - we launched the 'Sisterhood of the Travelling Shorts' campaign which saw our 'Traveller' shorts be worn on high profile fashion bloggers and raise funds for the National Breast Cancer Foundation. - we launched our 'Are We There Yet' S/S collection which sold out online over night, and was stocked in some pretty amazing stores like Globalize and Karibu Boutique. - we set off on a journey to Brisbane and successfully showcased our pretty pieces at an upcoming designer fashion show. - we shot our first lookbook and seasonal campaign with the amazing Sarah Davies whom we fell in love with! - we launched in New York City in an amazing little boutique in SoHo. - we were featured in Girlfriend Magazine and some other rad publications! - we made our day-dreams come to life. in 2013 we continue our journey of love, passion, creativity and dedication. Here is a little sneak peek of what's to come. - we launch casper&pearl in stores in Canada and New Zealand. - more travelling, designing, inspiring and being inspired. A huge thankyou to all of our loyal fans, customers, readers, lovers, stockists and muses. We couldn't be where we are without all of your support. The pics are great!! Yeah, 2012 is nearly over! I`m so happy about that. Can`t wait for 2013! I love your blog. there is also this flower wreaths on your shop? check it out my Blog! I follow you on GFC and blog and bloglovin. What do you think about the colaboration? Wow, such nice photos! Looks like you had a great year! Sounds like a good year, good luck in the new one. I like the way you show your style. I have just fallen in love with this blog. Sooo delicate, lovely, light-hearted, refreshing, and just plain adorable!!!! So glad I can follow you on your journey into a new year!! YOU GET BETTER AND BETTER. I am so following. I hope you can check out my site: http://theproverbs.net and join. Thanks for your time. God Bless and Keep Posting :) ! Great photos ! ;) Happy, happy new year to you !!! I hope all your wishes will come true ! Really cool! Congrats on you for everything you have achieved this year! :) Wish you a successful 2013! wow ! All that's amazing, hope you have a wonderful 2013 year! I love your blog, will definitely come back a lot!! this is really amazing!!! you have RIHANNA as one of your 11,000 followers !!! THAT IS LIKE MAJOR COOL!!!!!! it's such an honour for you to drop by my blog!! i hope you can follow me back too !but it's okay if you don't! i don't follow people just for them to follow me back! good luck in reaching your goals in 2013! love your post and blog! happy new year! Thank you for your good wishes! I am impressed your work :) Happy New Year! Please follow me back as promised! Great achievements, girls! I hope next year will be also so successful for your blog! I see that you'll have a sparkling 2013!!! You had a great year and Im wishing you an even better one! You've got a beautiful blog!I follow you :p Hope you follow me back! Love these photos! Your flower crown is perfect! would you like to follow each other? Let me know! So cool that Rihanna follows you! Following via GFC and bloglovin first, please do the same as promised! wow, i see it was an amazing year for you, you deserve it! It seems like an amazing year for you! Wish you the best to the next year! yes i'd love for us to follow each other! Thanks for visiting and commenting :) Congratulations on your accomplishments in 2012! Wishing you a Happy and successful New Year! Nice things happend in 2012! Thanks soooo much for your nice words! It's a pleasure for me to hear it! looks like a big year! you manage to do a lot of thing in only one year! happy to hear that you are making your dreams come true! Thank you guys for your sweet words on my blog! I'm your 163 follower on Bloglovin' ! Beautiful pics and seemed you had a lot going on there :)! amazing pics and seems like you had a wonderful year! Following you via GFC and Bloglvoin. All your designs, photographs, and accomplishments are beautiful, and I can't wait to see what happens next! So many beautiful photos and important events in 2012 ! I hope that you have a great new year ! Fabulous post dear! It seems like you had an amazing year! 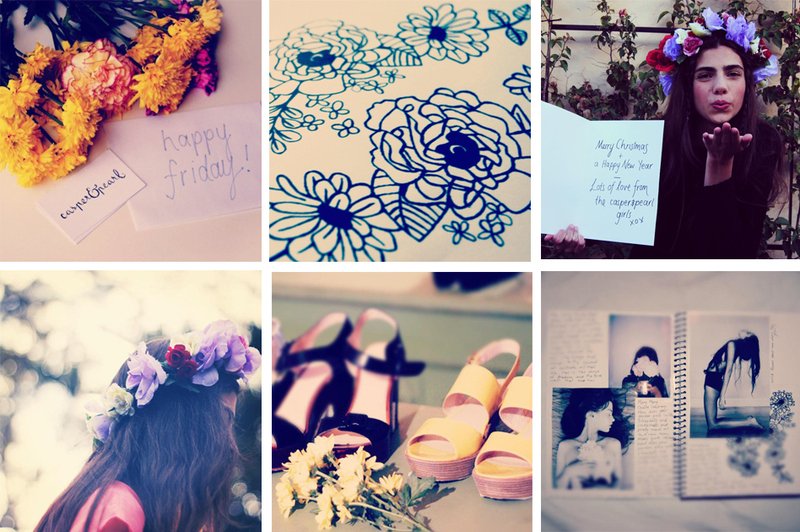 Love the photos with flowers in your hair! amazing photos! :) Happy new year! what a lovely blog!love it! Thanks for your comment ! Following you, hope you can do the same ! great outlook on the new year to come!! Thank you. Following gfc nd bloglovin. Waiting for your return and a happy new year! all these photos are <3 perfection! love your look, too!! Cute post, love it ! Happy New year lovelies! I hope the best for casper & pearl in 2013. Wish you even greater things during 2013!! Congratulations for everything you already have!! Thank you for your lovely comment at my blog!! Hope to see you there again!! welcome you new follower!! Just love your blog! Happy New Year!!!! and i love it. haha. have a happy and blessed new year. Nice resolutions! And congrats for your achievements in 2012! Wow, you guys did have an amazing year for your line! Your blog is perfect. kisses Happy new year. wow, congratulations for your success! thank you for the comment on my blog :) happy new years to you! Aw, congratulations, amazing, it's my dream to start my own fashion brand... one day ey. Happy new year!